← Hire People, Not Companies! Finally the Raya season is slowly coming back to normal pace as people getting back to work after a long break and daily routine is on…pheww! We made ketupat palas as usual for Raya though this time our ketupat tend to be lembik and lack of rasa lemak because I put too little salt in the santan..huhu! And daun palas we bought from pasar were all too small, some were like 3-4 jalur. Nevertheless I considered the mission to make ketupat palas a success since it was really challenging trying to cook with an active toddler like our son. Hopefully next year it will be better and less stressful..sigh! Well, how many ketupat or lemang you guys had during this year Raya? 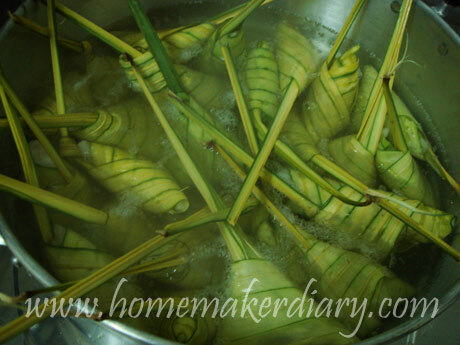 I wonder if people still make ketupat for open house..haha! 2 Responses to More Ketupat? I used to cook many more hard-to-cook dishes pre baby years but now even the act of frying fish or stir fry vege is challenging esp. when dear son is asking me to hold him up to see what I’m cooking on the stove, or holding my legs while I try to move fast from the sink to the stove..sigh! And that’s not to mention what I have to hurdle through on the kitchen floor..ada la segala trap dia letak, food, utensils n whatnot..but then again, I think it’s a good experience for him to be in the kitchen and see how mama cooks..hopefully he’ll grow up to be a handy helper soon..